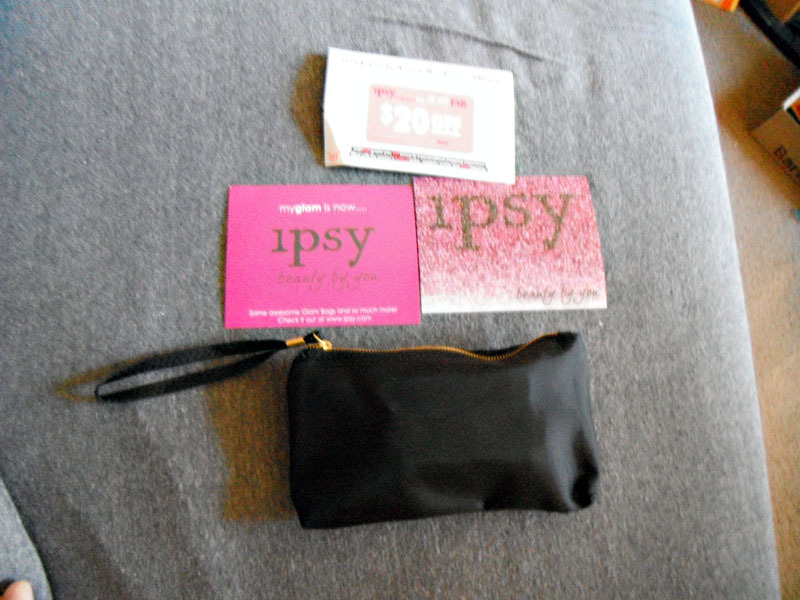 After almost a year as myGlam, they have decided to change their name to Ipsy and try a new "beauty by you" approach. They promise that this will ensure that we receive appropriate shades/formulas of products for our skin tones and preferences. I have read plenty of people complain that they dislike the name and think it's a bad move...I personally could not care less what they call themselves as long as I consistently get decent products. As far as the personalization goes, I have mixed feelings. Now, if they truly are tailoring colors/shades and formulas of the products to our needs, that is great. I hope, however, that they don't start having actual true box variations. sending out boxes with completely different products in them. One of the things I like about myGlam is that everyone gets roughly the same thing, and there is no giant variation in box value. Other subs that do this generally have a lot of dissatisfaction and box envy from those who get the less desirable boxes, and if everyone is paying the same fee every month, I do believe everyone should receive roughly the same items. Along with this revamp, they also have a new, more social website. I haven't played around on it much, yet. But, onto the important thing: the products themselves! Here's what I got for September! I thought it was cute that the info cards were covered with lots of pictures of subscribers! It was a nice touch, and goes well with the "Beauty by You" theme. 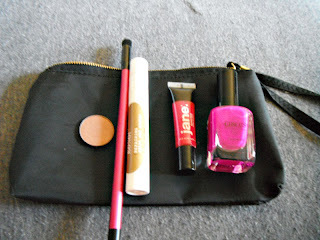 I love the bag itself this month! It's a little black wristlet, and it feels like decent quality. I really appreciate that they have been sending out lots of different kinds of bags: mesh bags, zip bags, bags that snap...I enjoy variety. This is one of my favorite bags so far...I love that it's simple enough to use on its own as a wristlet. 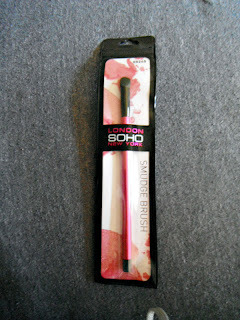 The first item I received was too big to fit in the bag - it's a smudge brush by SOHO. This brush is super long! I don't mind that at all. Now, it is intended to be a smudge brush, for softening liner and applying product to the lash line, etc. I personally find that it is more like a crease/blending brush, and that's the purpose I've been using it for! It's synthetic and a cute color. It's not the highest quality brush I own, but it has already seen a decent amount of use and works well enough. This is Repairing split end sealer by Carol's Daughter. I'm working on growing out dyed, damaged hair, so this is a great product for me to receive. 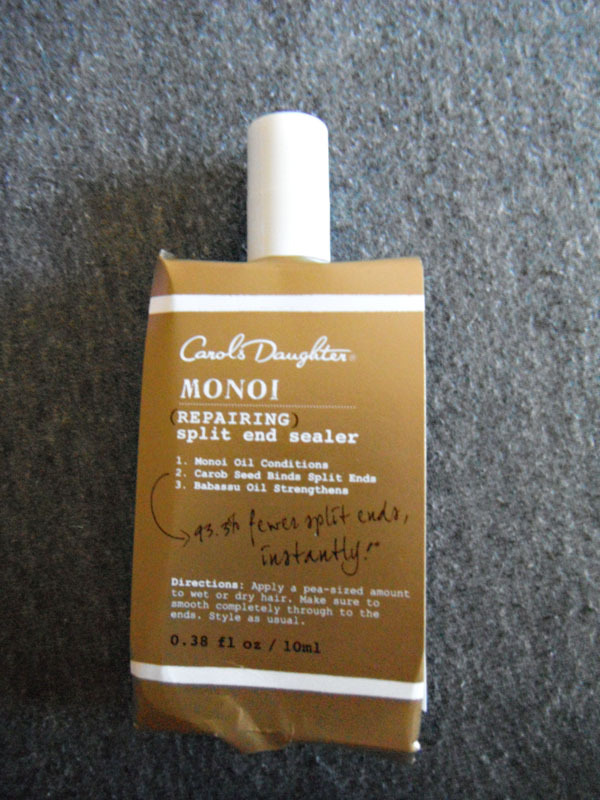 It promises to bind frayed and split ends and prevent further damage, using Monoi oil. I don't know about binding, but I can say that it leaves my ends nice and soft and smooth. It's a nice product! I'd be interested in trying more products by Carol's Daughter. 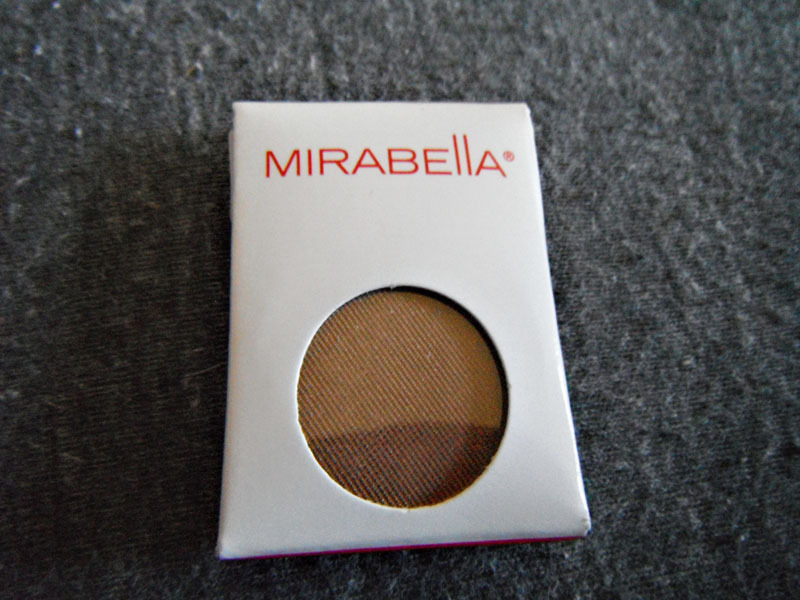 This is a pan shadow by Mirabella! The shade received is "Semiformal", which is a nice subtle brown with a pearly finish. This is a great neutral for me, not too dark, and it doesn't pull too warm. While I don't find it super pigmented, I don't mind that with shades like this. It is nice and soft and satiny. My only complaint about this product is that I don't have an empty palette to put it in. 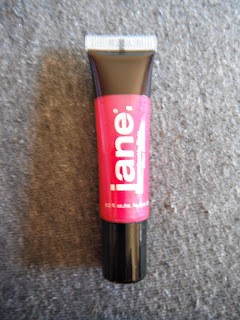 This is a lipgloss in Sparkle Pink by Jane. I remember buying Jane makeup when I was a kid, and apparently they've recently relaunched! This gloss is a bright pink with some subtle sparkle. I find that it's a little thick, but it isn't too sticky. It is decently pigmented for a gloss. I like it well enough, but there is nothing really special about it. I have received about a million glosses in the last couple of months, so I don't know if this will get a lot of use for a while, but it's not a bad product at all. 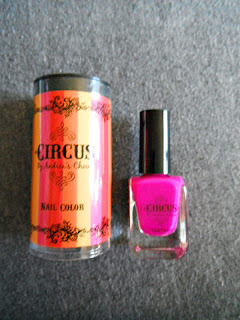 We also received the final color in the Circus line by Andrea's Choice - Tightrope. It's a nice bright purple (and this color is hard to photograph! It is more purple and less pink than it appears in photos). I love this color! I now have the purple, pink, and orange shades and they are all super bright and fun. I like the formula...while it is slightly streaky, it's easy to get a nice thin coat and I really love the unique matte finish. I'm happy to have gotten these polishes, but I am definitely glad the collection is through so I can start receiving some different things! In all, this is a pretty decent bag for me. I like the colors and the brush, and I'm interested to see the new direction they are headed in. What do you think?